What and Where is the Old town of Cannes: Le Suquet Cannes Old Town? You probably know Cannes as the town that is famous for its glitz and glamour, its many celebrities, the film festival, and the multiple glamorous events held there every year. But there’s another part of Cannes that shows a completely different personality, and that is the old town of Cannes. Most people know Cannes by the place de festival and the Croisette. 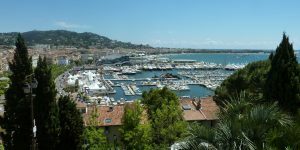 In fact, a lot of the tourist that visit Cannes never go farther than the surrounding areas of the Croisette and Rue D’antibes. 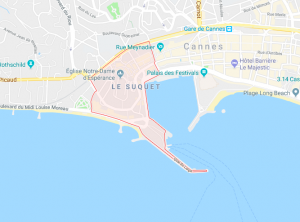 But those who seek more from Cannes, and want to explore a different side of Cannes that offers so much more than the glitz and glamour Cannes is known for goes to the old town of Cannes, by the name of Le Suquet. Le Suquet is just minutes away from the heart of Cannes, yet still, the vast majority of people miss out on this incredible gem. The old town of Cannes is the original fisherman’s’ residential area of Cannes. The houses belonging to the fishermen, the majority of which are still standing today in the narrow streets are more than hundred years old. The old town of Cannes: Le Suquet become the property of the monks of the Iles de Lérins in the 11th century and in 1088, the Château de la Castre, which is the main attraction that draws tourists to the old town today. The area around the Château de la Castre is the oldest part of the old town in Cannes. Then, gradually, the area surrounding the castle was built up, and then, the watchtower which you can see from the harbor and even from the place de festival was built up. The Watchtower, which you can see from many places in Cannes was built to defend the old town from Saracen invasions and piracy. The monks used to signal between the tower in the old town of Le Suquet and the tower on the island St Honorat, located just outside of Cannes. Fortunately, the community in the old town was able to protect itself from piracy and Saracen invasions, however, the vast majority of the population was extinguished due to the Great Plague. The old town is located, just like all Provencal towns, on a hill for defense reasons. Le Suquet is a charming and tranquil Old Town, that few people regret visiting. The old town of Cannes was initially a Roman camp. The streets of Le Suquet were laid out at least 400 years ago. In fact, the rue du Suquet is the original main road into Cannes. The rue du Suquet came below the walls of the castle located on the hill to protect from any enemies, and today, it is a charming old pedestrian street full of amazing restaurants. Where is Cannes Old town located? The old town of Cannes is located in the area of Le Suquet, however, the whole area of Le Suquet in Cannes isn’t made up of the old town. In fact, you could say that the old town is located on the hill of Le Suquet because the old buildings are very clearly focused on the geographical area on the hill. Just minutes away from the heart of Cannes, the old town can easily be visited by a nice walk. Otherwise, tourist “train buses” (petit train) go around large parts of Cannes, and stops right next to the watchtower, in the castle, located in the Old Town of Cannes. Taking the petit train allows you to see lots of interesting parts of Cannes that not everyone gets to see during their vacation, and moreover, during the tour, you get a set of headphones where you can listen to a narrator that tells you information and history about the area you’re currently riding past, including the old town of Cannes. The petit train departs from the Croisette, close by the Place De Festival. Whether you get to the old town by walking or taking the petit train, the old town offers a magnificent view over a large part of Cannes. 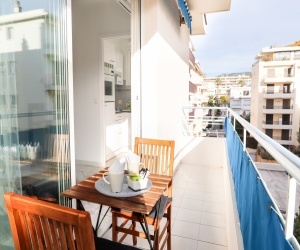 The old town is therefore perfect for the people who want to soak in the history of Cannes and imagine how it was to live there some hundred years ago or just enjoy the view. Or, of course, do both! The old town of Cannes has lots to offer, and if you want to offer, so if you want to experience it all, spending a whole day there is to recommend. But, of course, the old town of Cannes is very close by, which means you can go there the next day as well! In the old town of Cannes, you can visit the primitive art and antiquities museum which is located inside the castle in Le Suquet, appropriately named Musée de la Castre. With the museum being inside of the several-hundred-year-old castle, the museum experience becomes even more interesting. The museum displays ancient artifacts and artwork from all over the Mediterranean, which allows you to get an insight into the people who occupied the region and get a better understanding of how it was to live at that time. Of course, an old town is not complete without a church, considering the fact that religion played a huge role in the lives of the people. At the very top of the hill in the old town of Cannes, you can, therefore, find the gothic Notre Dame de l’Esperance church. This is a church that was built during the 16th-17th century AD, a time when lcoal fishermen crowded the area. From the church, you have the most amazing view over the old port of Cannes, which makes the Notre Dame de l’Esperance church a must-visit when in the old town of Cannes. In the church, you’ll find lots of objects that show the great fishing history belonging to the old town of Cannes. Just outside of the Notre Dame de l’Esperance church, you’ll find a wonderful garden and a Baroque square where you can sit down for a minute at a café for a coffee, or enjoy a relaxing lunch. If you’re in the old town of Cannes during July, you’ll even be able to enjoy free classical music in the square at the ‘Nuits Musicales du Suquet’. If you thought that the view from the top of the hill was amazing, you can get even better views by going up in the bell tower, if it is open. If the weather is clear, you’ll even be able to see the Iles de Lérins from this point. The old town of Cannes has lots of idyllic cafés, restaurants, bars, and boutiques, making it a perfect place for tourist that really want to experience the southern-French culture. During the evening or the day, there are always places where you can sit down and enjoy the stunning classical buildings and the magnificent view. For people who want to experience more than just the restaurants along the Croisette, the restaurants in the old town is a popular place to escape to – both for the local inhabitants, but also the tourists that have realized that there’s a lot more to Cannes than the Croisette and Rue D’Antibes. The old town of Cannes is also known to have connections with the man in the iron mask, as it is said that he escaped from the island of Ste Marguerite and then sought protection and refuge in the Le Suquet. However, the man in the iron mask was then re-captured and sent to Bastille. The restaurants in the old town of Cannes are known for great food, but most importantly traditional French Mediterranean food, which allows you to get a slice of the French Mediterranean culture. The old town of Cannes is also a lot more laid back and relaxed than the rest of Cannes, which is great if you feel like a relaxing day, yet one that you won’t regret. The church tower is lit up by night, creating an incredible view, all the way from the Croisette. This makes the old town of Cannes an amazing place to visit – both by night and day. You’ll love the fact that most of the old town of Cannes is pedestrianized, with no cars in sight, allowing you to embrace the small local shops and the local products they sell. The most famous street in the old town of Cannes is the Rue St Antoine. This is a restaurant full of wonderful traditional French Mediterranean restaurants that offer an experience out of the ordinary. The old town of Cannes, located in Le Suquet offers a contrast to the glamorous life in Cannes and is the perfect place for people who want to see a different side of Cannes. The old town of Cannes is a must-visit for the people who love culture and old buildings, as Le Suquet offers lots of it.